This is the original plate No. 42 from "Wild Flowers of the World" - a fine water-colour painting by the renowned botanical artist Barbara Everard (b. 1910, died ?). It is a highly decorative work in very good condition with vibrant but accurate colours, being much finer than the rather poor reproduction in "Wild Flowers of the World" suggests. And far larger too, measuing 47 x 37cm. It has hand-written pencil notes to the reverse presumably in the hand of Everard, regarding the species depicted and various printing notes. Barbara Everard worked at Kew and is one of only nineteen "contemporary" botanical artists whose work features in William T. Stearn's "Flower Artists of Kew", 1990 (plates 9, 10 & 11) also published in America under the title "Botanical Masters: Plant Portraits by Contemporary Artists. New York: Prentice Hall, 1990". Everard began drawing and painting flowers in 1947 when in the Far East. 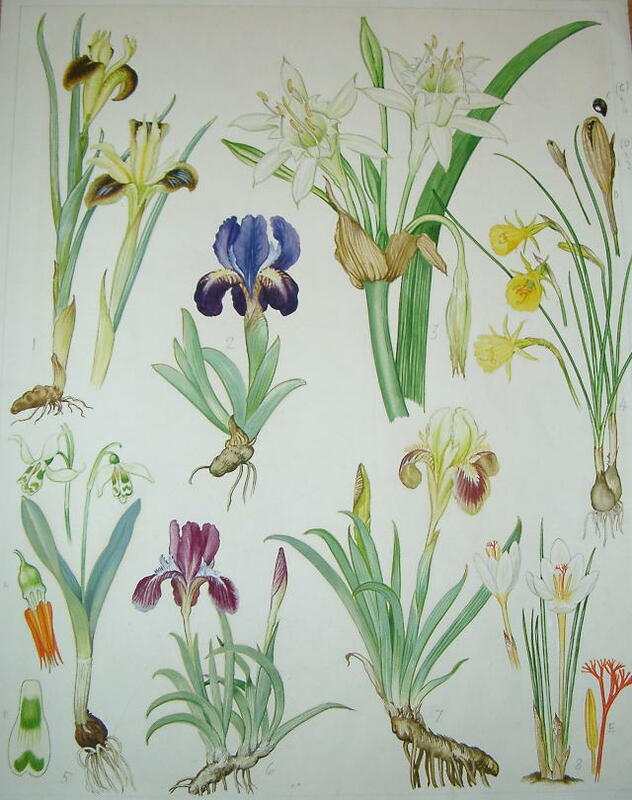 She has provided illustrations for many works among them O. Pulin and A. Huxley, Flowers of the Mediterranean (1965), but her major work was the superb and highly successful 'Wild Flowers of the World' (1970) with text by Brian D. Morley. This monumental work, whilst neither rare nor expensive has become a classic of the botanical literature, in large part due to the 192 plates by Everard, featuing over 1000 of the world's exotic and colourful plants - and this is a rare opportunity to acquire one of these original plates. Everard was a keen and accomplished gardener with a fine collection of orchids. She set up the "The Barbara Everard Trust for Orchid Conservation" recognising the need to conserve private collections of orchids as they often contained plants no longer growing in their native habitat. The Trust is administered by the Orchid Society of Great Britain as a separate charity. As much of her time was spent illustrating books, she rarely sold her paintings privately and on her death left her orchids and the majority of her paintings and studies to the Royal Botanical Gardens, Kew. Consequently her original paintings are rare, but given their quality should be in every serious collection. We have a few other orginal plates from "Wild Flowers of the World" and would be pleased to offer discounts on multiple orders. For further details or images please do not hesitate to contact us. (Please note: this painting supplied without mount or frame but we would be happy to arrange framing and mounting on behalf of our customer).